What’s up y’all, I’m Rachelle! If I were a bender I would be an earthbender because people tell me I’m grounded. I prefer salty over sweet and have been in the Avatar fandom since I was a kid. I have a background in writing, literature, and publishing. You can find me on twitter at @rachellephant where I ramble about all manner of political and personal intrigue or at femmedia.net where I write about the intersection of gender and media, or hit me up at my personal site for more information. Hello Friends! It’s your resident Pisces and potential waterbender. I’m Marissa and I’m factually part fish. You know I’m a qualified Avatar Scholar from my avatar tattoo and my immeasurable logged hours watching cartoons. Once a fiddle player drunkenly yelled the Avatar Theme to me in a bar and that was pretty cool. When I’m not blabbing about ATLAB, I’m a Production Assitant in reality TV. If you want to see more of my online antics, check me out on Insta @marissamation and at youtube.com/mbick4d. Icon credit: tumblr user Kamala. 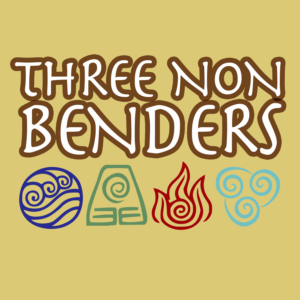 We are Three Non Benders, an Avatar: The Last Airbender podcast. Hailing from backgrounds in literature, film and TV, we came together to discuss the show analytically because we believe it matters to look closely at the things we love. Sadly, we are not benders, but if we were, we would be pretty good at it. Visit our Team page to learn more about us. The life circumstances of your non-bending co-hosts has changed! The 3NB team will be on hiatus until further notice. Please continue to enjoy the episodes we have on the site until we check back in! Subscribe to this podcast on iTunes or enter your email below and receive updates every time we post.